Scooty…A word that has become one of the “buzz words” in Pakistan. Scooty in Pakistani market does not merely refer to a 2-wheeled vehicle but also possesses an empowering perception of its own. 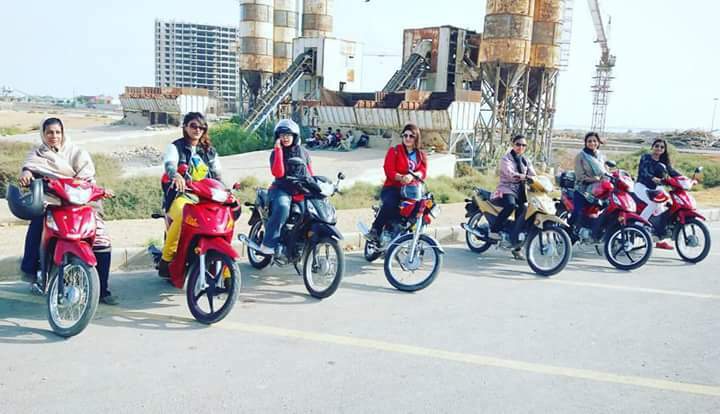 Scooties are especially meant for female transportation and with this initiative of commercialization of scooties, an invisible barrier of societal pressure on females would be broken. Although this perception is a taboo for many since there are women drivers in Pakistan who drive cars, even for a living. Nevertheless, with such an initiative, women of Pakistan would feel more empowered and equivalent to men. Students, teachers and young professional are already much fond of this new initiative and are supporting this cause that would empower the female population of Pakistan. With the development of society, females are getting education on same grounds as men and marking their roles towards the betterment of Pakistan. Whether its education, health, welfare or social sector, women are striving hard to make themselves empowered. One of the biggest advantages that will happen on the society would be shift of male mentality, if such a movement penetrates. There are different countries around the globe that have commercialized scooties for their female population. Even our neighboring country India has passed anti-harassment law for women who travel via public transports or on scooties. But will the same conditions be applicable in Pakistan? It has become a disputed topic of what future does the scooty really hold? Majority of the female population belonging to the urban areas of Pakistan believe that it is a good alternative vehicle introduction for those who can’t really handle the hassle of a car. Many of the people also think that the effects of introduction of scooty in the society would be inappropriate and misleading. Having viewed the statistics, I think that scooty DOES NOT hold a bright future for the long run until few changes are done on the roads of Pakistan. Having said that, the major factor that justifies this eerie statement as stated above is bad road conditions. Let alone rural but the roads of the urban areas of Pakistan are poorly structured which leads to many accidents daily. Although, the introduction of scooty would be a positive step towards facilitating 51% of the population BUT the roads need to be smooth, clean and safe for the common people, not just for the localities of DHA or other elite housing societies. Having said that, I come forward with my second factor, that is safety. Belonging to the state of Pakistan, the mentality of men here has come out to be more dominant. To compete and excel in this technological era, boys and girls are brought up in the same environment but with different social values. Hence, the acceptance in this society by men to allow their homely females on the roads would be a tad bit unacceptable. This again takes my ground on the fact that our culture has many barriers that although our religion does not impose but is imposed by this culture that we belong to. Within this culture, a third factor resides within that relates with the psychological state of mind of the people from this culture. The human mind in general holds the property of differentiating between the good and the bad yet becoming biased, at times. This means that people of this culture majorly have strong roots and circulate the same among their younger generations. Hence, unacceptability/ intolerance to this new wave of culture will take time to settle. This opposition would be strong in the rural areas of Pakistan whereas the urban areas might accept it partially. The commercialization would although be a chain-breaking movement by the automobile industry for the female population but it is the mindset that needs rectification primarily. by Zeenat Anjum, A.M Development, Ghandhara Nissan Limited. The author is an engineer by profession but writes out of passion. She is a striving young MBA graduate who has an entrepreneurial venture of her own. Apart from that, she trains young individuals and “youth” about the digital world and its relation with tech industry. The author has her own personal blogs and you can view some of her write-ups on LinkedIn. I strongly disagree with the word “Scooty”, it is underbone bike. Some how in in our society ,Scooty have been perceived as a bike for females only, which is incorrect ( our older generation has been driving Vespa, is not it so?). Underbone bikes are popular among males and females especially in East Asia. It gives protection to the drivers knees and from water splashes because of its shape, It also has good storage space and even the driver’s helmet can be placed in the compartment below the seat. A basket is also attachable just like Vespa below the bike handle. Instead of using old design 70cc bikes we should promote underbone bikes. For full features ,google for HONDA WAVE and other manufacturers.Thanx.